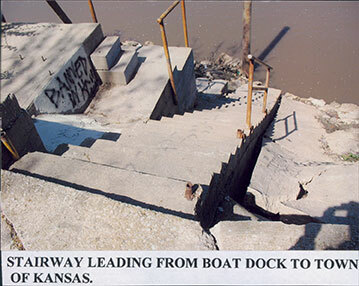 I want to talk to you today about a rock ledge along the south bank of the Missouri River at Kansas City that served as an all-weather landing (or wharf) for thousands of steamboats over an interval of 75 years. 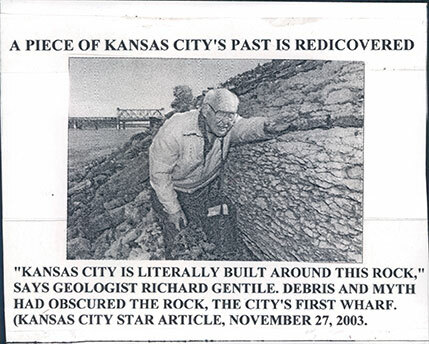 The rock landing speeded up the development of Kansas City by 2 or 3 decades and is testimony to the benefit that geology has contributed to the building of a city. 2. 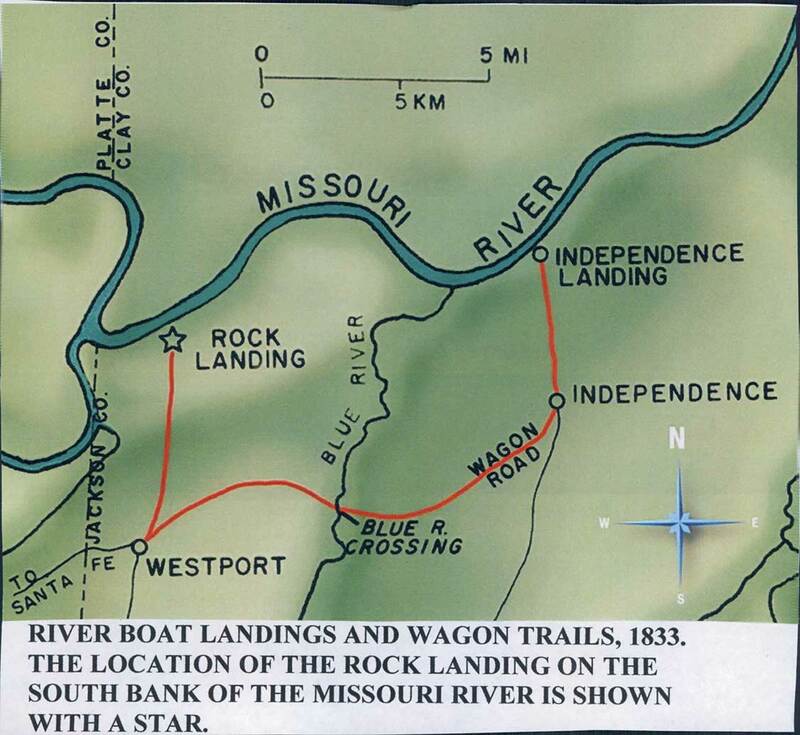 River boat landings and wagon trails, 1833 the location of the rock landing on the South bank of the Missouri River is shown with a star. 3. 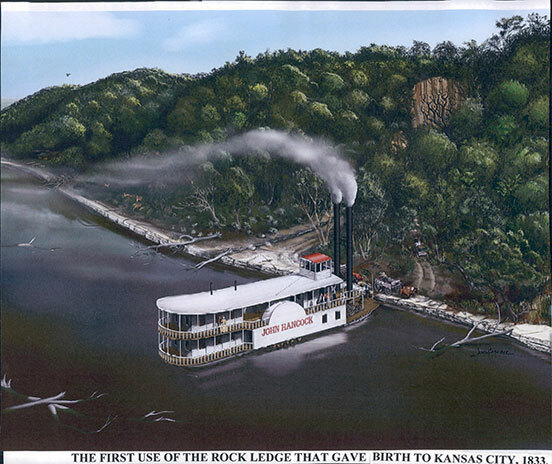 The first Use of the rock ledge that gave birth to Kansas City, 1833. Three gorges 30 to 40 ft deep lead from the upland to the river. John Calvin McCoy came down one of these gorges with 3 teams of oxen to pick up his supplies. 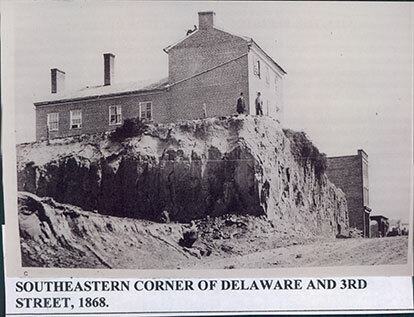 Reflecting back to 1833, McCoy wrote, "from Grand Avenue to Delaware was a narrow strip of ground varying in width between the foot of an almost perpendicular hill and the edge of a rock ledge against which the waters of the Missouri flung themselves harmlessly, and which formed a natural and good steamboat landing." The ledge was just wide enough for a horse and rider to pass and the bluff was over 100 ft high. The rock ledge known as West Port Landing. 4. North-south cross section of the Missouri River bluff at Kansas City. 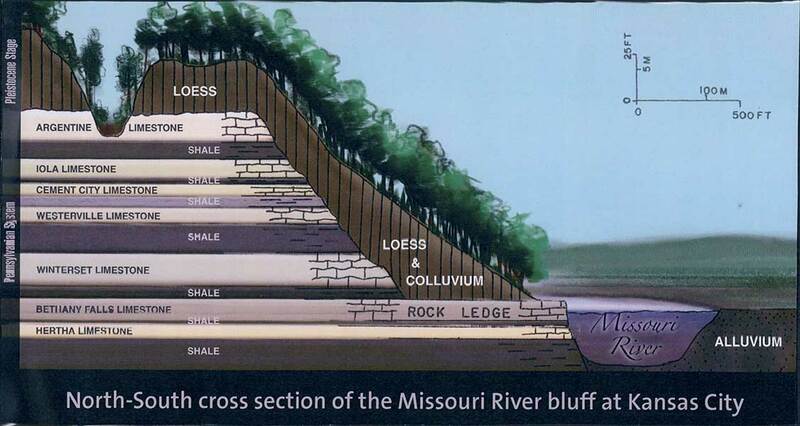 There are 2 major groups of rocks underlying the bluff. a)	Bedrock- alternating layers of limestone and shale of Pennsylvanian age. 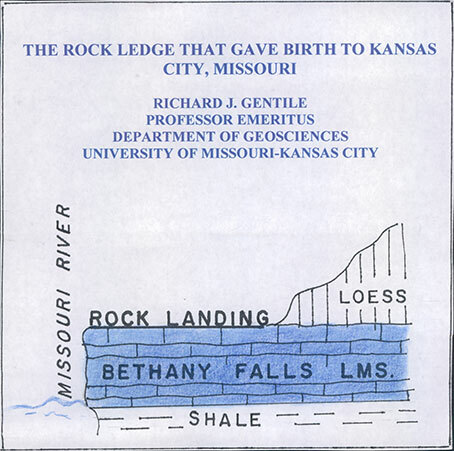 The Bethany falls Limestone forms the rock ledge along the river. b)	The bedrock is overlain by wind-blown silt called LOESS of> less than 30,000 years old (Pleistocene).The loess cover is over 80 ft thick and has slumped down the hill and covers the rock ledge. The outside bend of the river is eroding into the bluff and has exposed the bedrock. The bedrock is covered along most of the length of the river. 5. 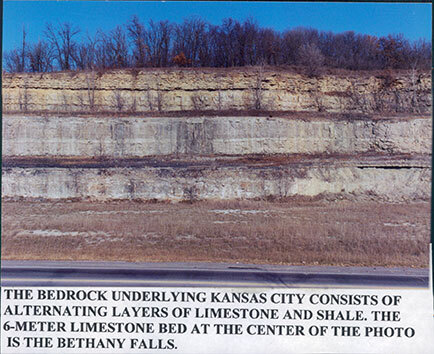 The bedrock underlying kansas city consists of alternating layers of limestone and shale. 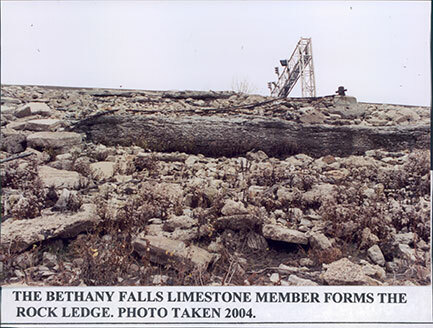 The 20 ft thick limestone bed at the center of the photo is the bethany falls. 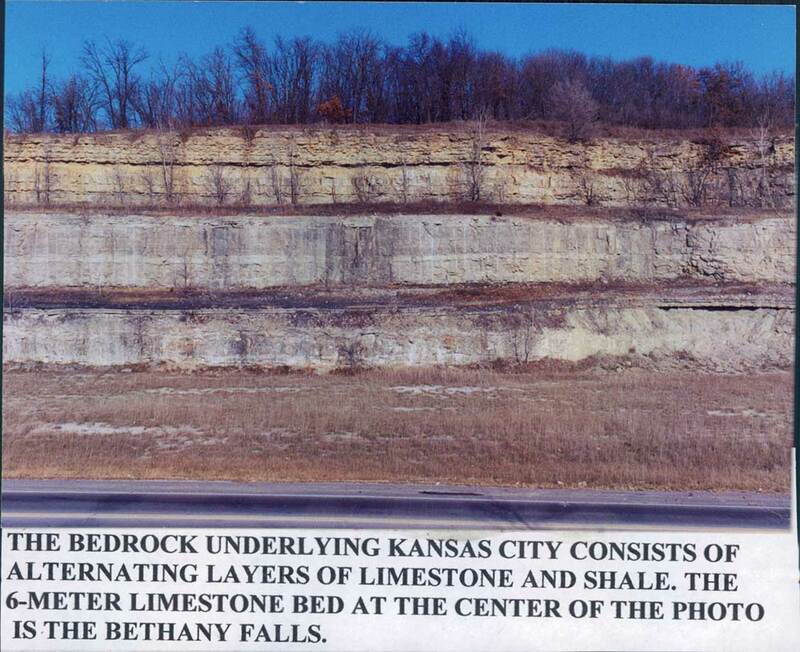 This is the section of bedrock upon which Kansas City is built. 6. 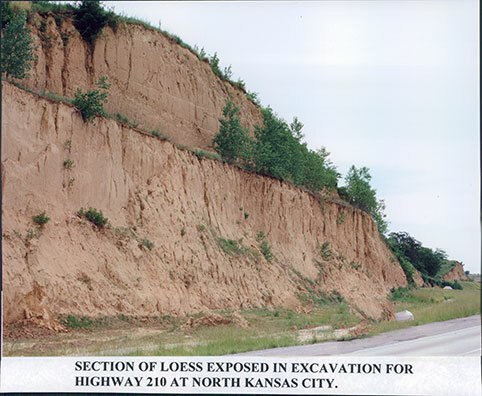 Section of loess exposed in excavation for Highway 210 at North Kansas City. 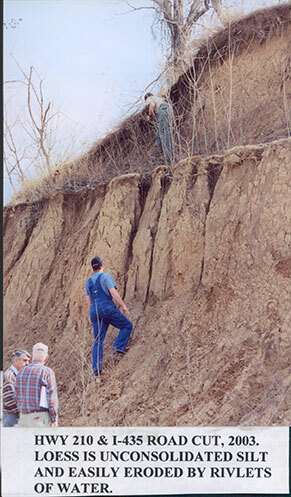 Loess is wind-blown silt of glacial origin. 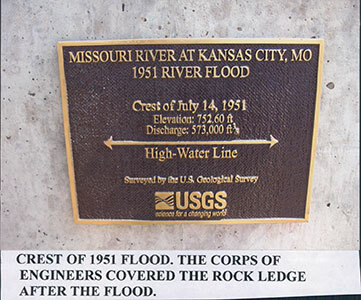 The silt was picked up off of the flood plain of the Missouri and Kansas Rivers and deposited on the bluffs. 7. Loess is unconsolidated silt and easily eroded by rivulets of water, Highway 210 & I-435 road cut, 2003. 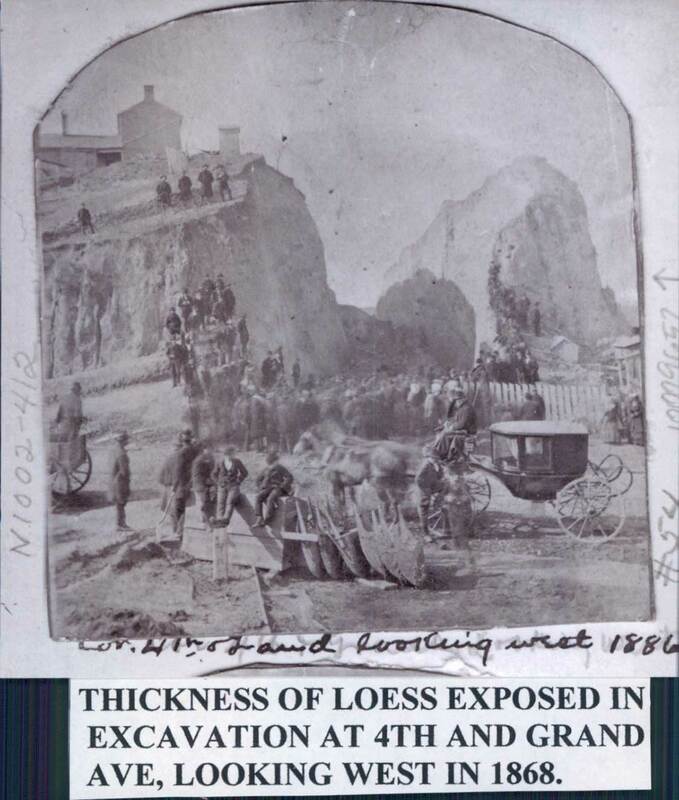 Loess is easily removed with a shovel. 8. 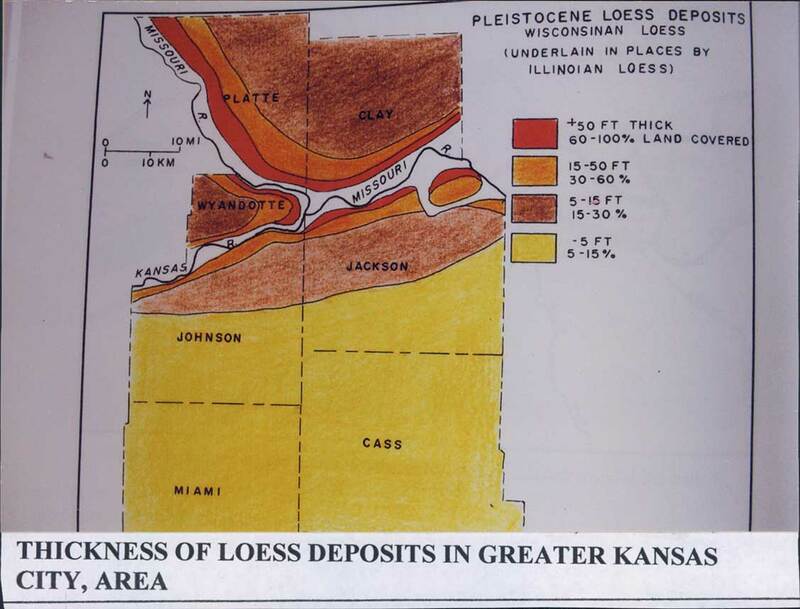 Thickness of loess deposits in greater Kansas City area. 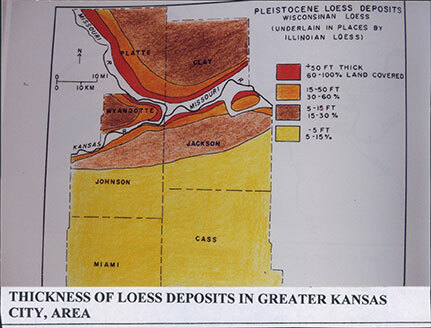 Map .The cover of loess is thickest along the bluff and thins geometrically away from the bluff. The thickest deposits are on the northwest side of the hills, The direction of the wind. 9. 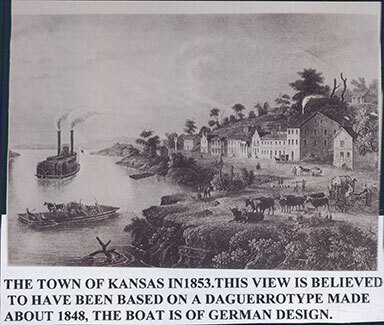 German etching showing Kansas City, Missouri circa 1853. This view is believed to have been based on a daguerrotype made about 1848. The TOWN OF KANSAS in 1853. This illustration is believed to have been done in 1848. The author said it was "drawn from nature." It may have been from a sketch, an etching or a daguerreotype (an early photograph produced by covering a copper plate with a silver solution - a very cumbersome ,time- consuming and expensive method that could not be reproduced. "The first photograph of this type was taken in Paris, France in 1833. The illustration could have been done in Germany from memory. The boat is of German design. Photography was not well developed in the United States until after the Civil War and by then the railroads were replacing the riverboats. 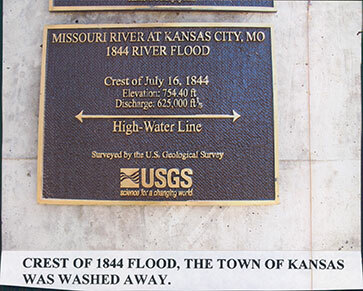 The heyday of the town of Kansas was in the 1850's. 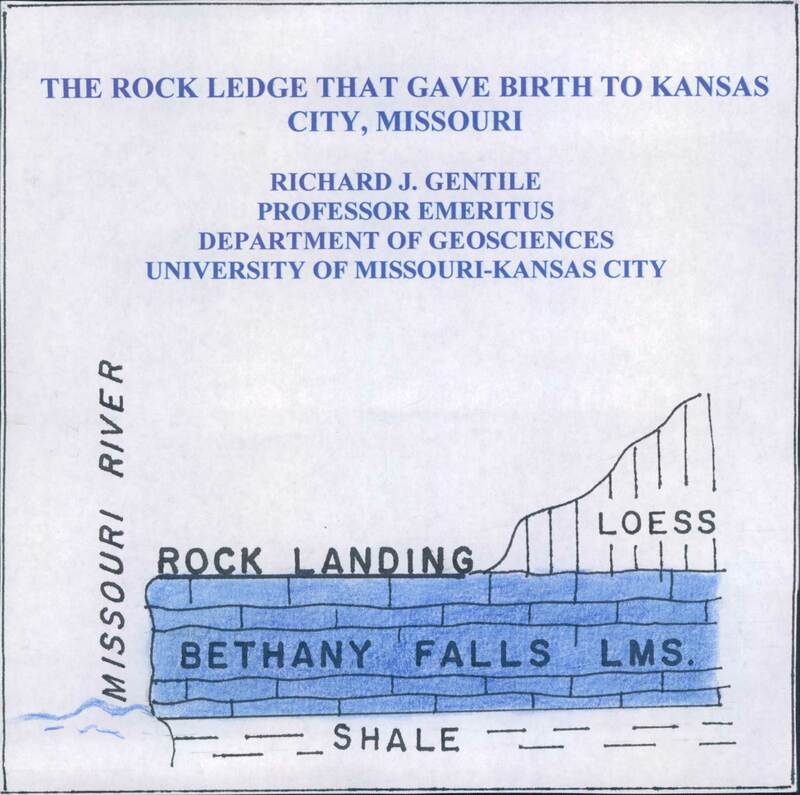 But the illustration does show the rock ledge. 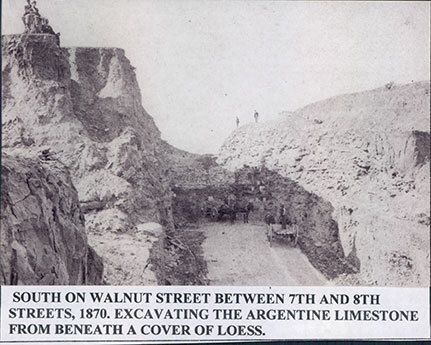 The loess cover has been scaled back for several hundred feet to make a stable all-weather wharf. 10. . the town settlement embraced -- even hugged -- the rock landing then straggled away toward the south over the hills. The face of the rock ledge is exposed above the water line. In 1857, the town of Kansas bad 40 manufacturers, including 5 saw mills, 3 brick yards, 2 grain mills, blacksmith and wagon makers, 16 hotels, 26 salons and a large number of gambling houses. The population was estimated to be 4000. In 1857, 750 steamers docked on the wharf and the following year 60 passengers carrying boats made scheduled stops. A visitor in the 1850's wrote, "The steamboat landing is perhaps the best on the Missouri River. In fact, the entire riverfront constitutes a natural wharf where any kind of vessel might discharge and pick up freight safely." Still other comments: Providence has favored us with an all-weather wharf. 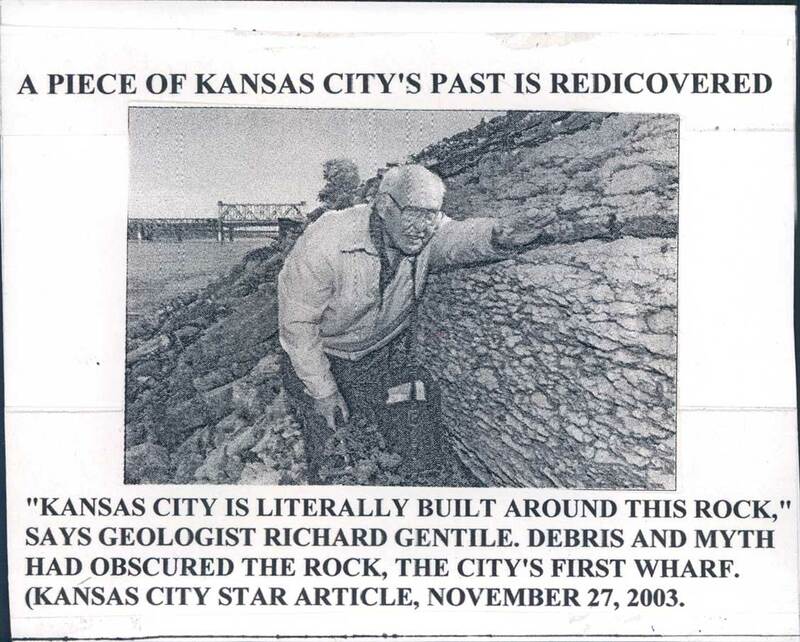 The Plymouth Rock of Kansas City. 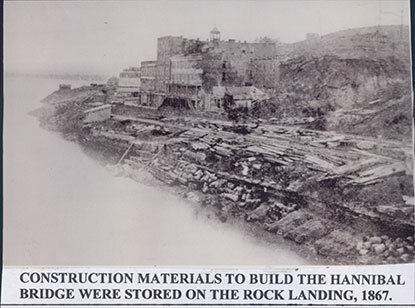 The rock ledge upon which the city is built. Kansas City's birthstone. But he added, "the sights along the levee were not easily resisted: The levee with its 3 or 4 steamers, large piles of Mexican freight, prairie schooners, mules, greasers, Indians, negroes, mud clerks, Frenchmen, emigrants, old settlers, tender feet, hotel drummers, brass bands, omnibuses etc. 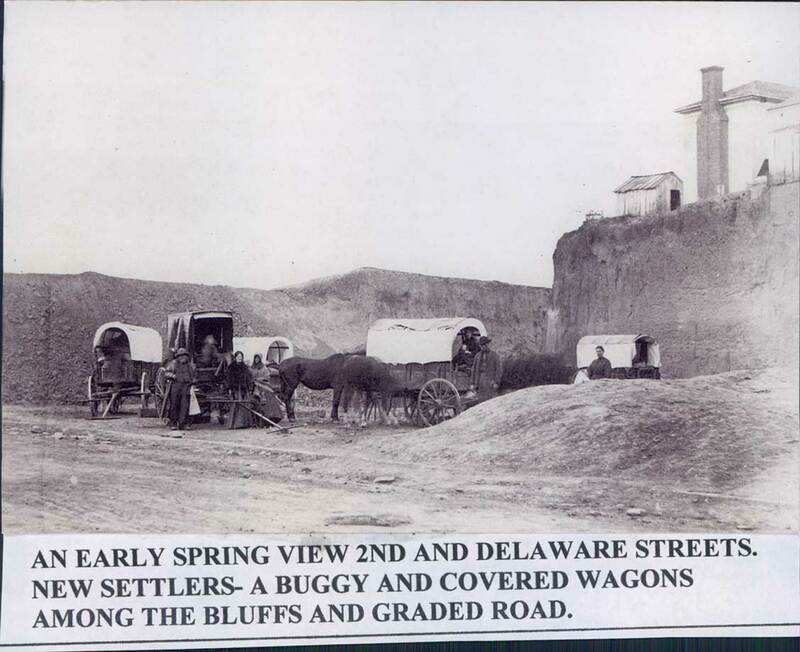 The town of kansas was a frontier boom town. 11. New settlers -- a buggy and covered wagons among the bluffs and graded road -- an early spring view at 2nd and Delaware streets. 600 caravans like the one you see here climbed the bluff and then on to Westport. The only route from the landing. Some wagon trains were 3 miles long! By the 1840's, the trails leading to California and Oregon had been established. A covered wagon with a large sail crossed Kansas in 2 days but the contraption was wrecked in eastern Colorado by a gust of wind However, in 2 days the wagon under wind power passed 40 wagon trains strung out across Kansas. Most of these wagons left from Westport. 12. Gillis House and rock landing between Delaware and Wyandotte streets, 1867. 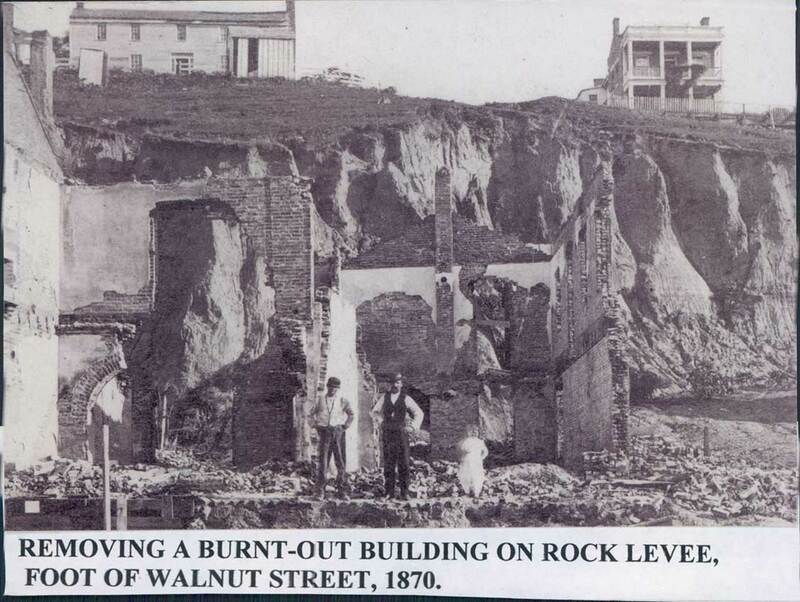 The rock ledge is plainly visible and forms a stable foundation for the Gillis House. The Gillis House had over 100 rooms, 27,000 guests stayed there in 1857-58. 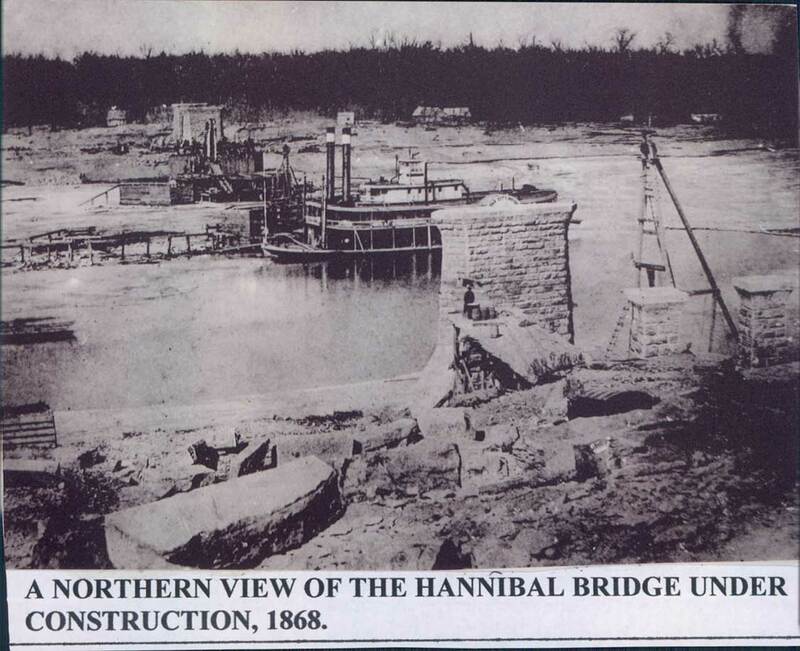 After the Civil War, railroads were being built across the country and Kansas City was racing against Fort Leavenworth to get the first bridge across the Missouri River. 14. Laying the Cornerstone for the Hannibal Bridge, 1867. 15. 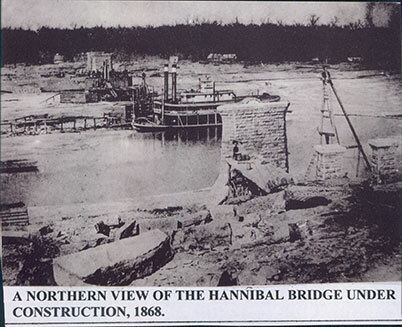 Northern view of the Hannibal Bridge under construction, 1868. 16. "Gulley Town". 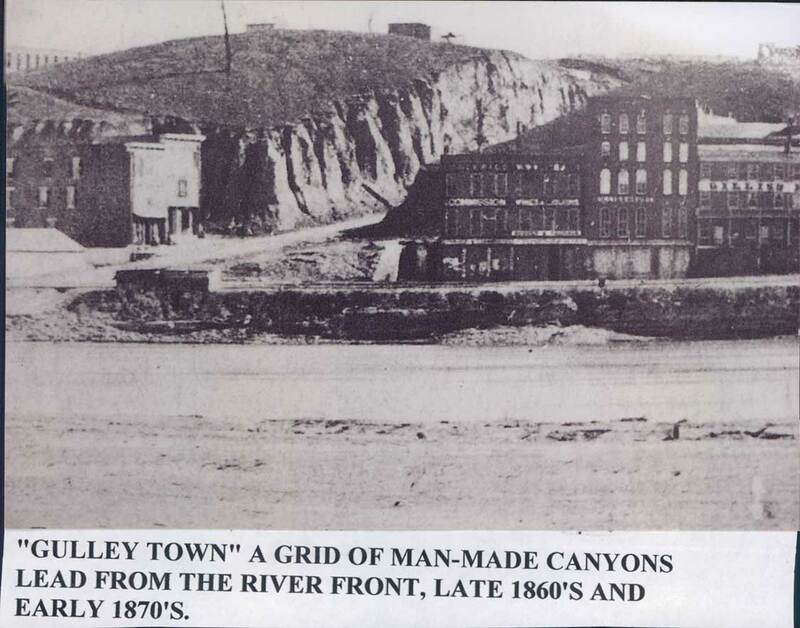 a grid of man made canyons lead from the river front, late 1860's and early 1870's. 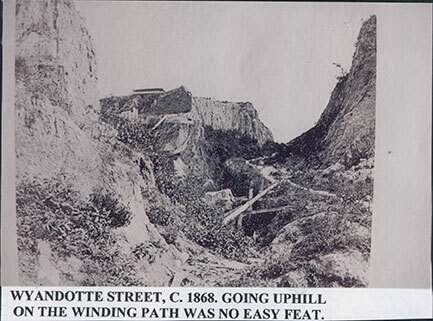 Although Kansas City was blessed with a stable all-weather landing, the steep bluff was a deterrent. 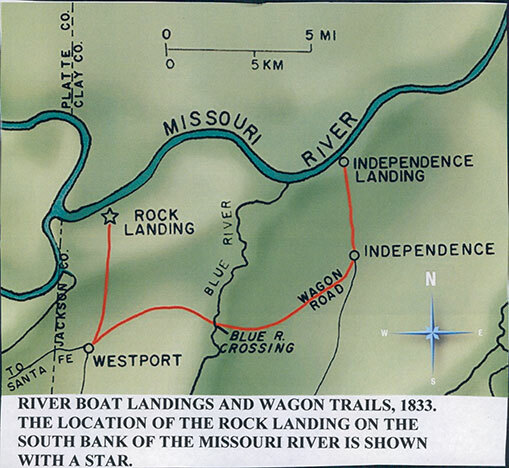 The site along the river was purchased in 1839 from an early French settler by a group of businessmen who formed a company and named the place The Town of Kansas. They subdivided the wharf and began selling lots. One of the members of the company many years later, John Calvin McCoy, wrote, "a few men with no capital bought the land because it had a good steamboat landing and was the most suitable starting point for caravans to New Mexico. The idea that anyone of them would live to see a city among these precipitous cliffs and impassable gorges never entered into their calculations. 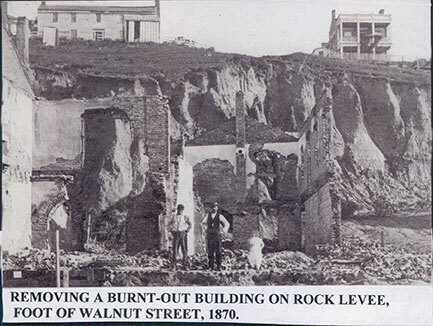 It seemed in retrospect that nature had exhausted her resources in a grand effort to thwart the city builders. Not only were the town founders faced with topographical difficulties but these difficulties were for many years seized upon by our neighboring villages to wound our sensibilities and lacerate our feelings and added insult to injury by applying to our protégé the low humiliating term "Gulley Town." A visitor to the town of Kansas in 1856 believed this was the least likely place to build a city. "Perpendicular hills, hills oval, hills ragged, long slopes, abrupt ascents, with ravines and gorges deep or yawning wide in wild confusion - all seemed to forbid house-building. The turbid river and mud cliffs destroy the pleasing affects generally attendant to northern rivers." Another eyewitness report, “a row of business houses along the levee, back of them a bluff with narrow streets cut through and further back homes stood trembling on the verge of high hills." The houses fronting the river are reared against the bluff with its summit far above the roof; and in the rear end, even in the third story, you have the earthy odor peculiar to a newly dug cellar." 17. 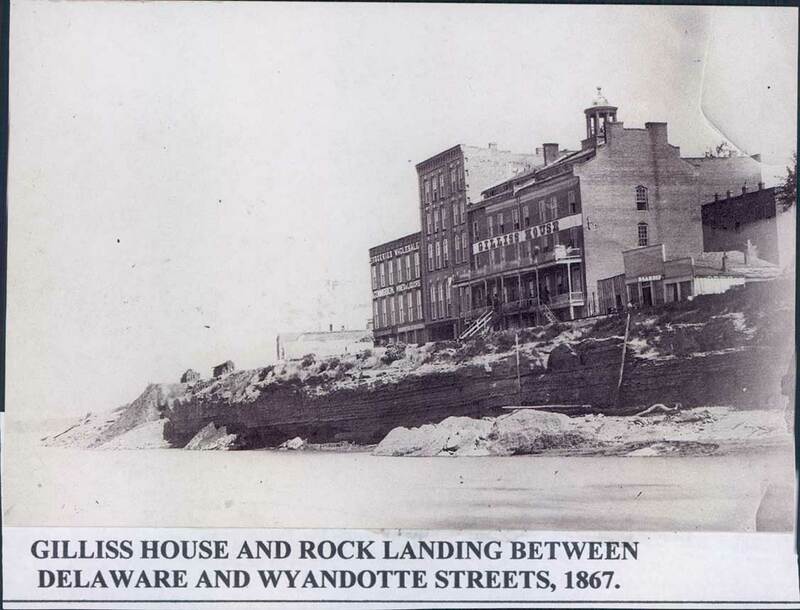 Wyandotte street circa 1868. 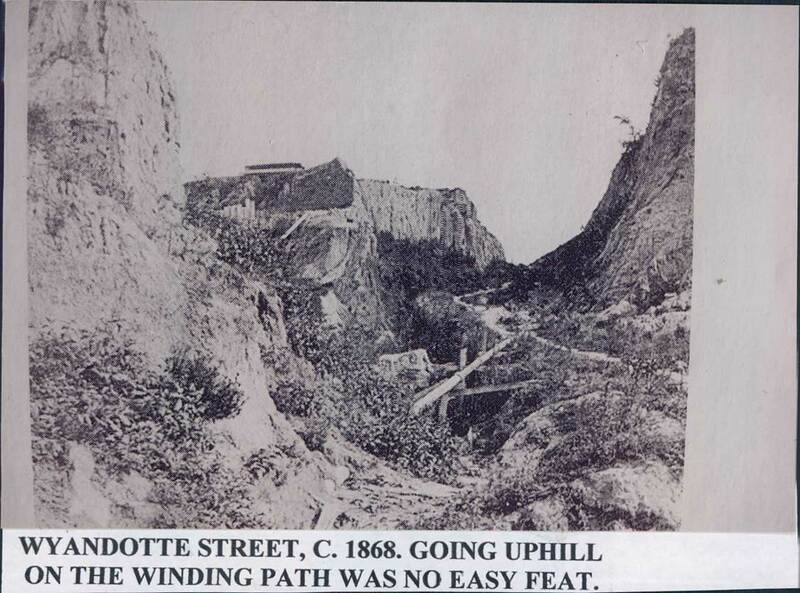 It was no easy task going uphill on the winding path. 18. 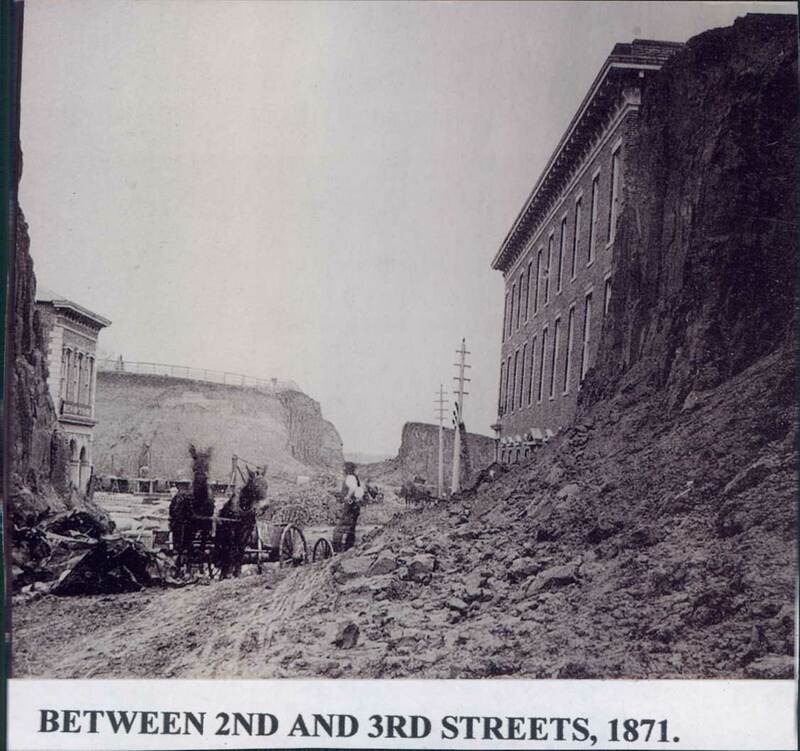 Roads were cut through a towering bluff of loess, 4th and grand avenue, looking west, 1868. 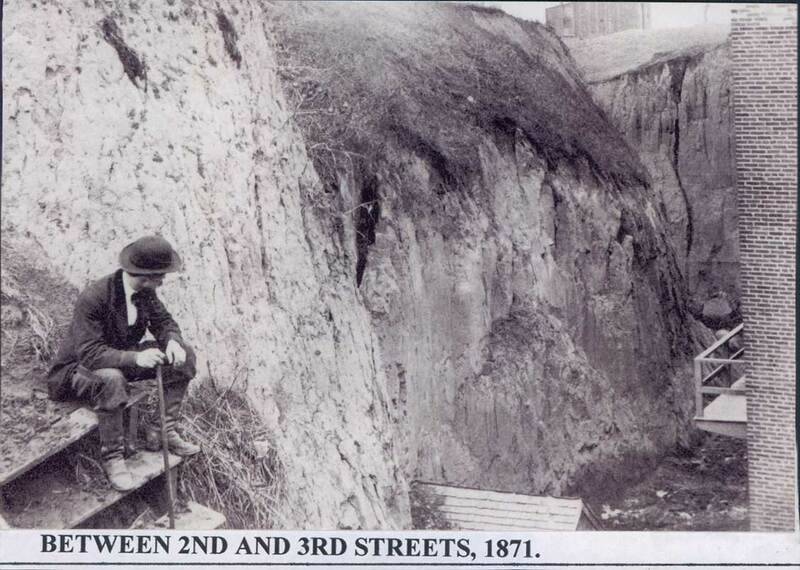 Grading the streets through the bluff was a formidable task. In 1856, grading began for 4 north-south streets back from the levee - Wyandotte, Delaware, Main and Market. 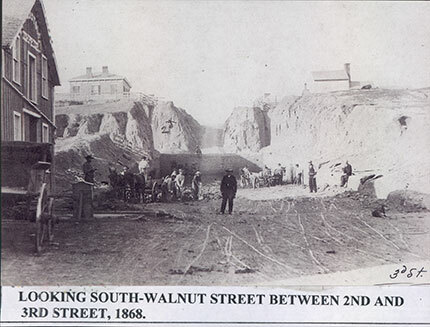 A cut 47 feet deep at the top of the hill was necessary to provide a grade 8 feet in 100 feet for Main Street (a 10% slope).At one point along Walnut Street, 54 feet of soil had to be excavated below the bluff. Work was interrupted for the Civil War but began again in 1865. There was a rumor that a man had been killed when he fell of the bluff and onto the roof of a 3-story building. 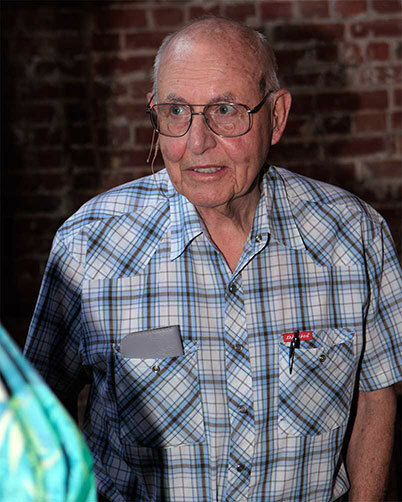 Dr. Lester, a physician, had an office on Main Street between 2nd and 3rd street. He left for a week, and during his absence, the street was graded and lowered 10 feet. He just added another floor. One year later the street was lowered another 12 feet. He just added another floor. Thus, he built a 3-story office building from the top down. 19. 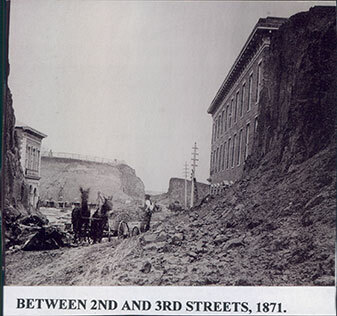 Deep gorge between 2nd and 3rd streets. 1871. 21. 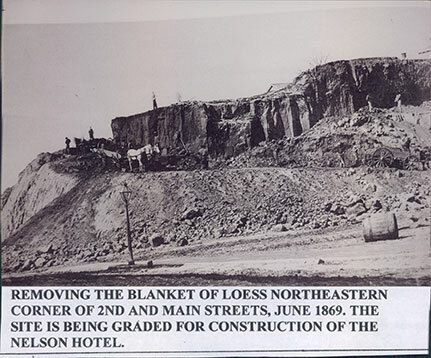 Removing the blanket of loess. 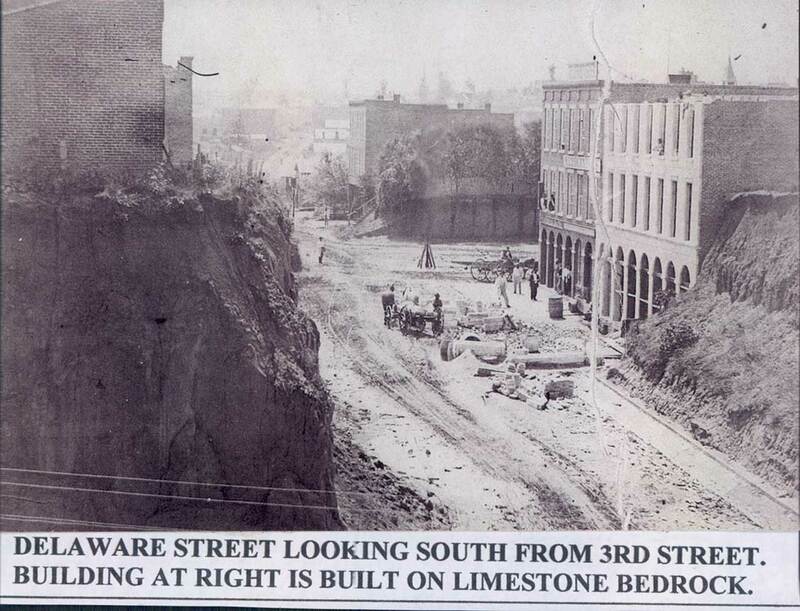 The site is being graded for construction of the Nelson Hotel, Northeastern corner of 2nd and Main streets june 1869. 22. Walnut street between 2nd and 3rd streets, looking South, 1868. 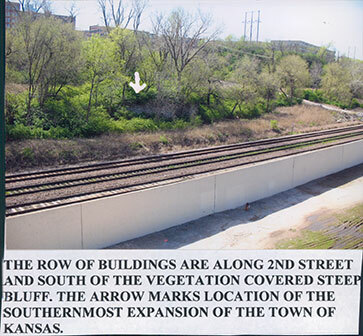 After these crews had finished their work, the land surface of Kansas City was changed forever. 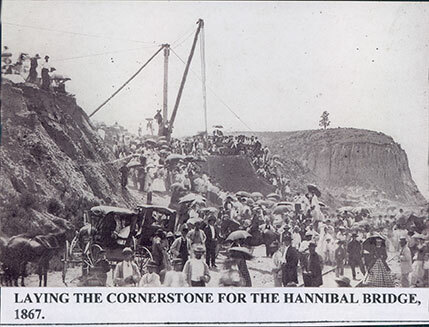 If a hill was in the way, they cut down the hill and through it into a ravine. 23. 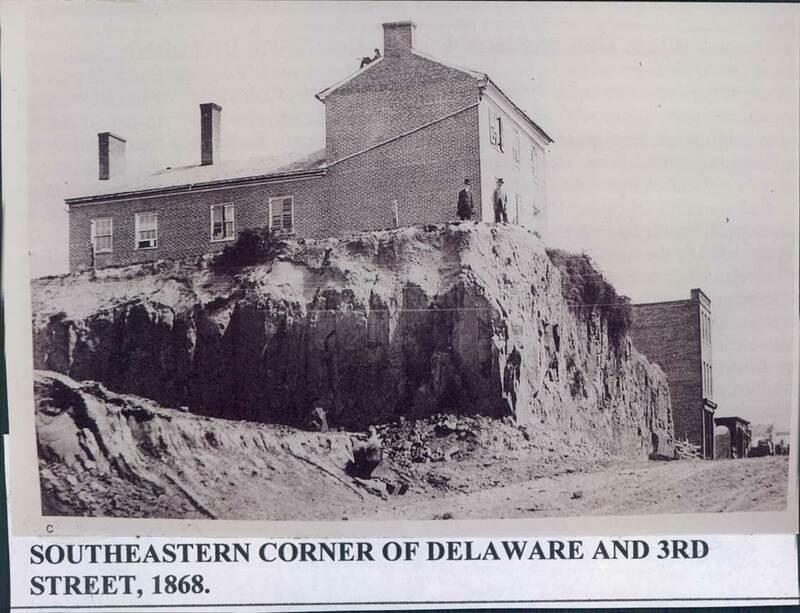 Southeastern corner of Delaware and 3rd street, 1868. 24. 2nd street between Delaware and Main streets, May 1869. Mechanics Bank building on left. 25. 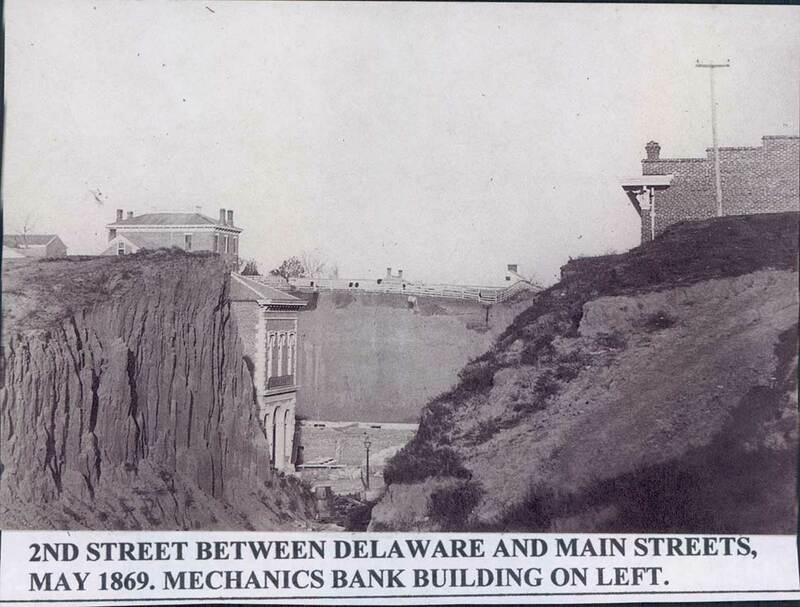 2nd street between Delaware and Main streets, 1871. Mechanics Bank building on left and a large new building on the right . 26. Looking south on Walnut street between 7th and 8th streets, 1870. the Argentine limestone is being uncovered from under a cover of loess. 27. Delaware street looking south from 3rd street. the building on right is built on limestone bedrock. 28. 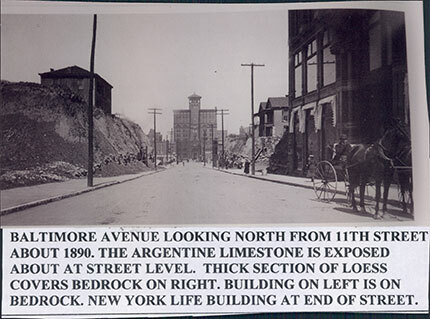 Baltimore Avenue looking north from 11th street about 1890. the Argentine limestone is exposed about at street level. a thick section of loess overs the bedrock on the left whereas the building on the right is on bedrock. New York Life building at end of street. 29. 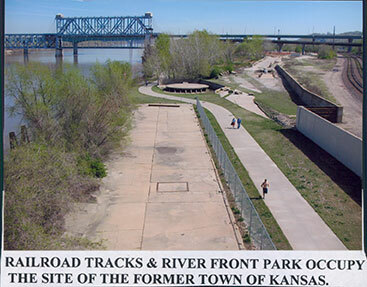 Railroad tracks & the river front park occupy the site of the former Town of Kansas in this modern day photo. 30. The arrow marks location of the southern most expansion of the Town of Kansas. 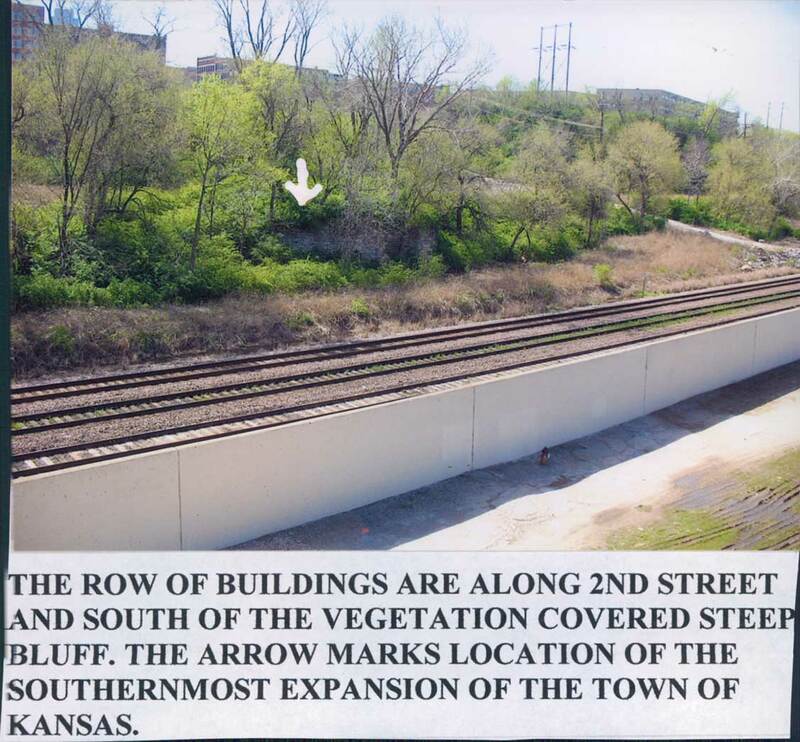 The row of buildings are along 2nd street and south of the vegetation covered steep bluff. 31. Passengers disembarking from river boats once climbed these concrete stairs to the town of kansas. 32. 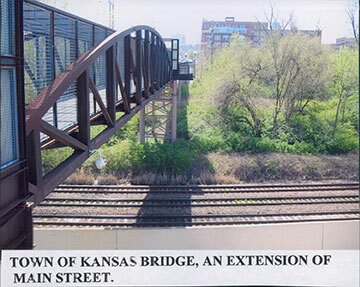 Town of Kansas bridge, an extension of Main street. 33. 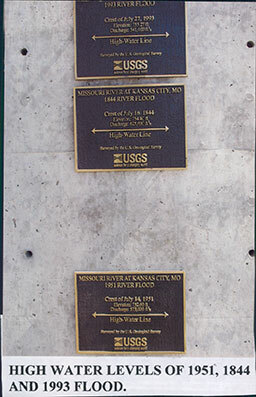 Plaques on bridge pillar mark high water levels of 3 major floods. 34. High water levels of 1951, 1844 and 1993 floods. 35. 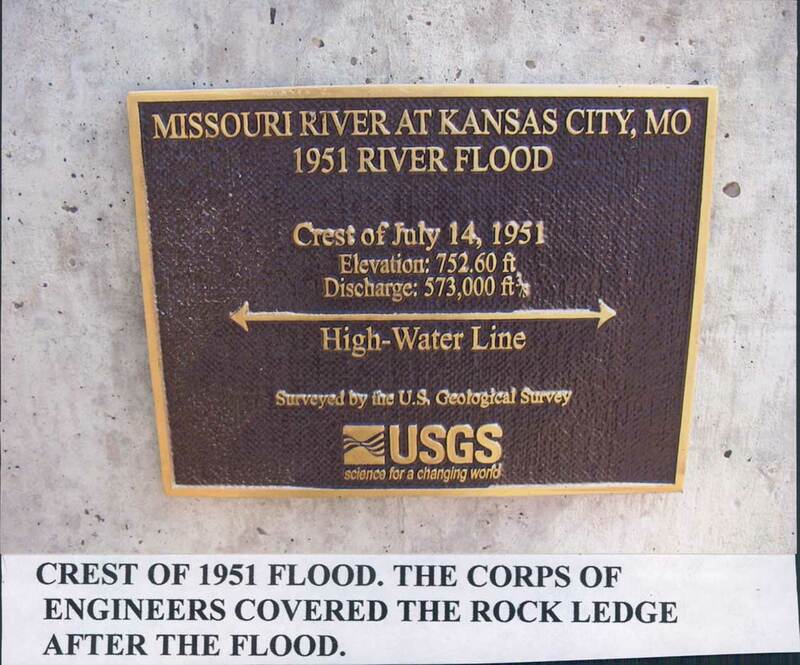 Crest of 1951 flood. 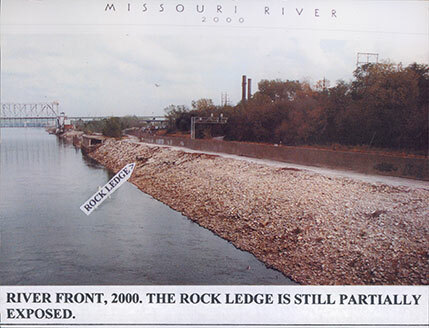 The rock levee was covered by about 20 feet of fill after this flood. 36. 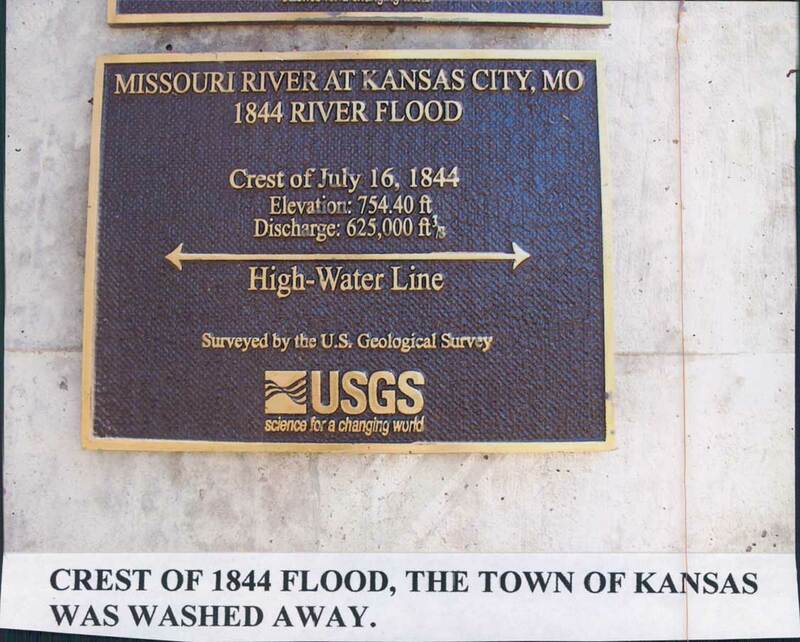 Crest of 1844 flood; the Town of Kansas was washed away. Only one house was left after the 1844 flood but the town was rebuild. The pioneers endured epidemics of cholera, typhoid fever and a devastating Civil War but they persevered and continued to march westward. They built a nation that stretches from sea to sea. 37. 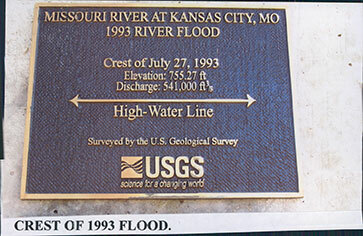 Crest of 1993 flood. 38. The rock ledge is still partially exposed in this river front photo, 2000. Only the rumble of passing trains breaks the silence. 39. The Bethany Falls limestone member forms the rock ledge, photo taken 2004. 40. 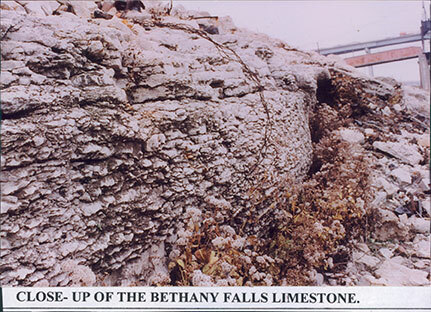 Close-up of the Bethany Falls limestone. The upper few feet is thick- bedded and formed a stable wharf. 42. River front looking West, 2012. The cables on the piers were used to tie- up boats. 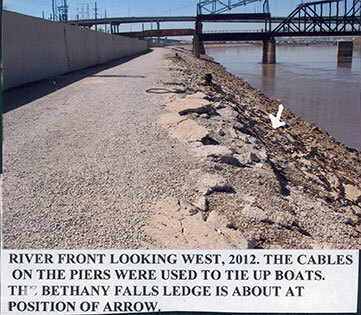 The Bethany Falls ledge is about at position of the arrow. 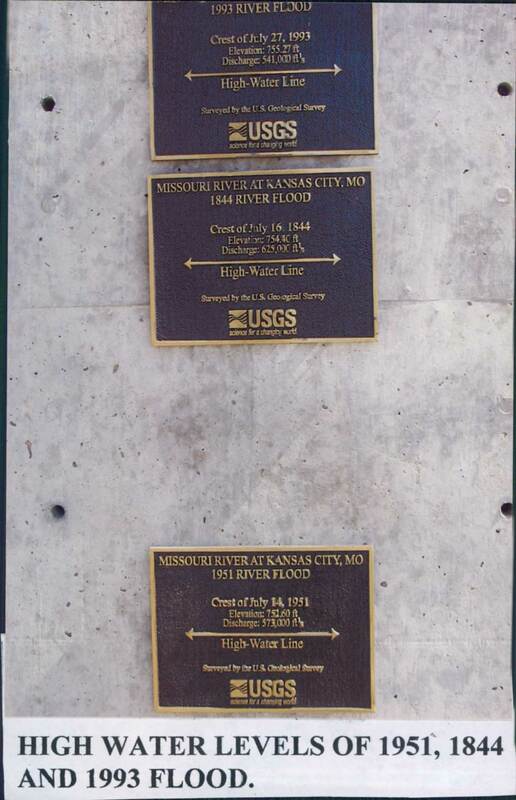 We have covered up a part of the early history of Kansas City. 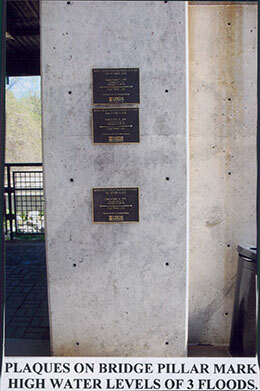 The River Front Commission and the Port Authority should erect a plaque along the riverfront and uncover a small area of the rock ledge with a stairway leading down to it. In passing, I wish the city fathers would have named the city Westport in 1888. 43. Dr. Richard J. Gentile, August 2013.